Jackie, a microbiologist by training but an artist by temperament, followed a career as a research scientist in the NHS before becoming a lecturer and manager at a local college. She was born and brought up in rural Buckinghamshire but has lived in Chipping Campden for more than 20 years. 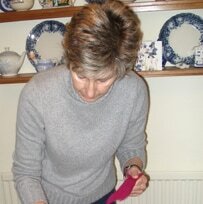 Jackie has had lifelong fascination for all types of textiles and has worked with fabrics, leather and yarn. Much of her understanding of design and craft has been acquired through experimentation together with specialist courses. She is a keen naturalist and her work is influenced by the seasons and countryside both here and abroad. Her creations are designed to express and enhance the colour and texture of the materials used. Her current collection includes handbags made from local tweeds woven at the Cotswold Woollen Mill as well as knitwear in exotic Spanish yarns.